Many aquarists consider the Fluval FX6 to be the ultimate canister filter. It’s packed with more filtration and features than most products on the market today. But is it the best choice for your aquarium? How does it compare to other filters? In this review, we’ve taken a closer look at the FX6 filter in hopes of answering these questions. 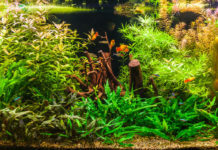 During the past three decades, Fluval has established itself as the go-to brand for superior freshwater and saltwater equipment – be it filters, aquarium pumps, or heaters. 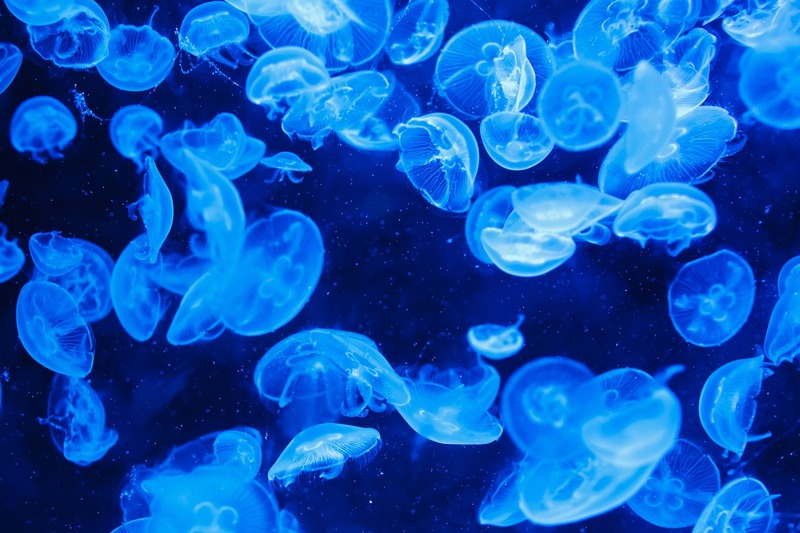 Needless to say, when our team was presented with an opportunity to review Fluval’s best aquarium filter – the Fluval FX6 – we were more than excited. As far as numbers go, the FX6 model is very similar to it’s (now discontinued) predecessor, the Fluval FX5. It’s motor is can fully re-process up to 563 gallons of water per hour, while the three media baskets can hold up to 1.5 gallons of filtration. This is more flow and filtration than you’ll find in most filters. When stocked with quality media, we found that the Fluval FX6 brings excellent results, even in more demanding aquariums. The Fluval FX6 canister filter can handle most freshwater and saltwater tanks up to 400 gallons. Still, for best results, we’d recommend a backup filter if your aquarium has over 200 gallons. At a height of 21 inches, this canister filter fits well under most aquariums, although you should be wary of it’s size if you own a small aquarium stand. Not only does the FX6 outclass many filters in terms of sheer output and capacity, it also separates itself with many features that make use and maintenance easier. 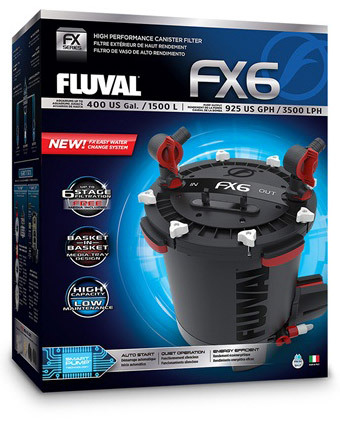 Powered by Fluval’s Smart Pump Technology, the FX6 filter monitors and optimizes it’s own performance constantly. Air is expelled from the filter on startup and once every 12 hours. If the impeller is obstructed by debris, the motor will shut itself off to prevent damage. If you’ve ever experienced the pain of manually priming a filter, you’ll be happy to know that the FX6 doesn’t need to be siphoned manually. As soon as it’s plugged in, the filter primes and starts itself, evacuating air from the body. Additionally, we found the filtration process itself to be very precise. Many cheap canister filters never manage to get all the water to go through the filtration media. Some water always finds it’s way around the media baskets – returning to the tank without being filtered at all. The Fluval FX6 filter seems to have been very precisely engineered to eliminate any water by-pass. A purge valve near the bottom of the filter allows you to empty any water before maintenance. This makes the Fluval FX6 much easier to carry during monthly cleanups, and allows you to take out the media trays without spilling water everywhere. 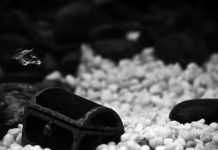 In the ocean of features that the Fluval FX6 offers, one feature stood out as somewhat useless. The “monthly maintenance reminder” indicator dials are something that a simple calendar can do just as well. While they have the same flow rate, capacity, and measurements (at least we’ve found the difference to be indiscernible), the FX6 comes with a number of upgrades to set it apart from it’s predecessor. The electronic circuit board has been upgraded since the Fluval FX5 release, allowing better monitoring of the water flow. It also consumes less power. With a more energy efficient approach, the FX6 model uses 10% less electricity than the FX5 version. The impeller, which was FX5’s weak spot, seems to have been upgraded as well. It’s now made from sturdier materials, ensuring a longer life. The intake stem can now be shortened or expanded, fitting on tanks of varying sizes – something that the Fluval FX5 lacked. 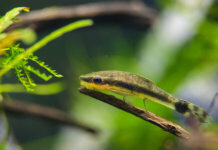 If you look at almost any Fluval FX6 review online, you’re going to have a hard time finding any complaints. It outclasses most canister filters on the market – not only in raw power, but also in fine technology and precise detailing. While we consider the FX6 an investment rather than a luxury, some fish lovers may find it’s price to be too much. For smaller, non-demanding tanks, a cheap canister filter may keep your fish just as happy. This filter truly shines on larger, more demanding tanks, and if you want to get the best value for your money, this is where you should use it.